When my wife and I visited the Russell Road Military Museum I found a number of vehicles that I could not immediately identify. 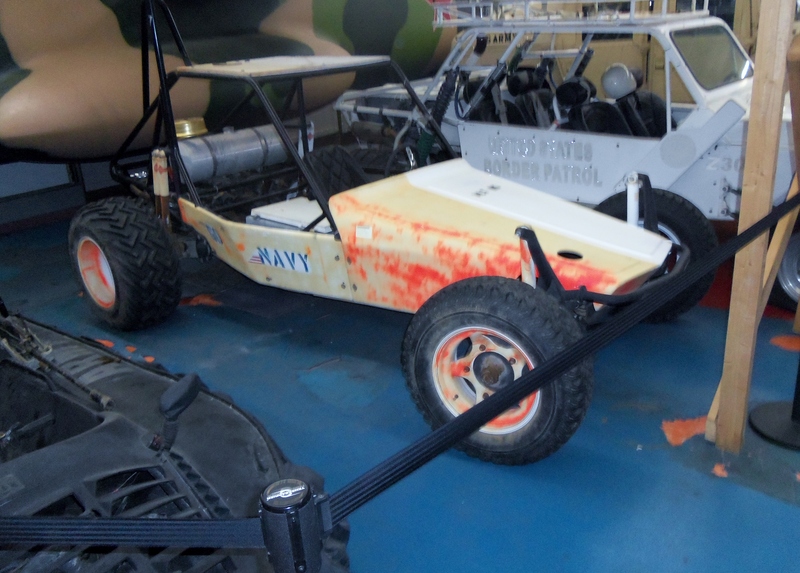 One of them was what appeared to be a dune buggy with US Navy markings. I wondered what possible use could the US Navy have for these small vehicles. 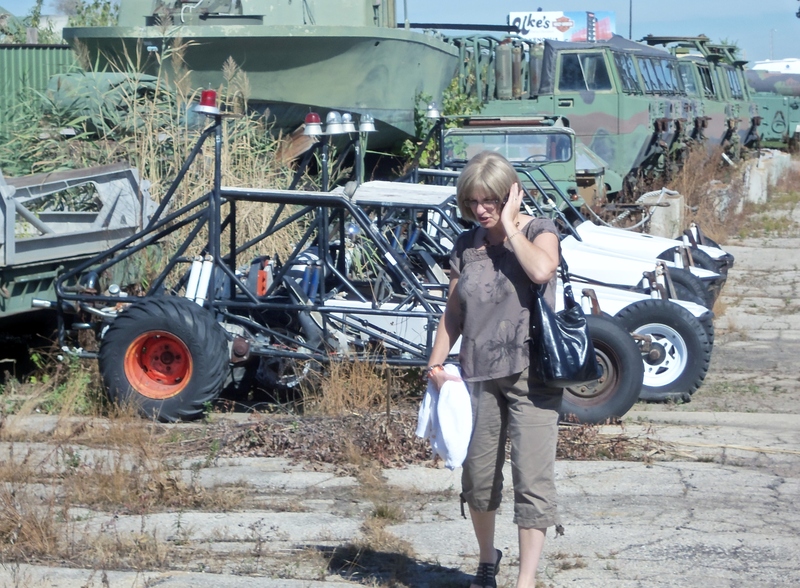 They looked like a cross between a go-kart and a dune buggy. And they sure looked like fun! Below are the three pictures I took of these little vehicles. My wife advancing beyond the dune buggies. I think she’s talking to the Navy about them and discussing where one might purchase one. Uh-huh. One of the dune buggies indoors. They were marked US Navy. The one next to it was marked “border patrol” as I recall. As I said I had no idea what these little vehicles could have been used for other than some fun. 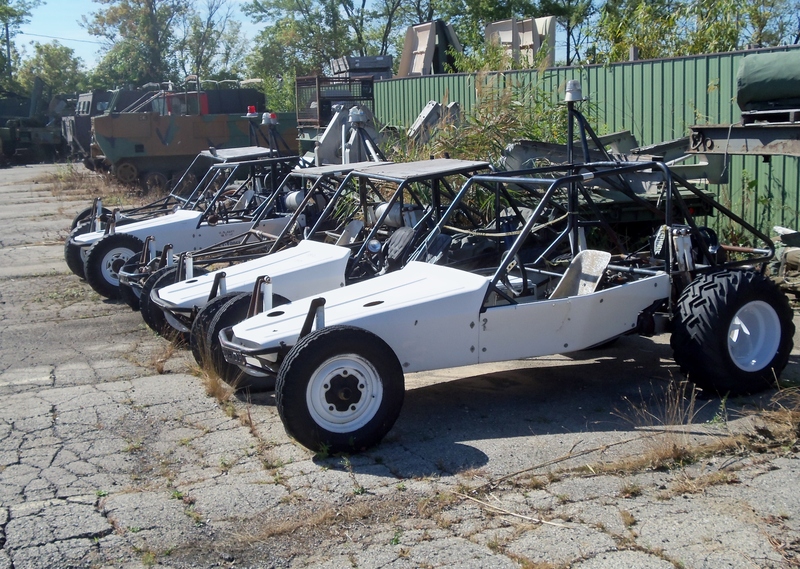 A Google search for “Navy Dune Buggies: turned up some interesting info. They were sometimes armed like this one below. A robot MG Carrier-just like a video game! Apparently, they were intended for manned use as well. This one below is US Army and modified for a three-man crew. 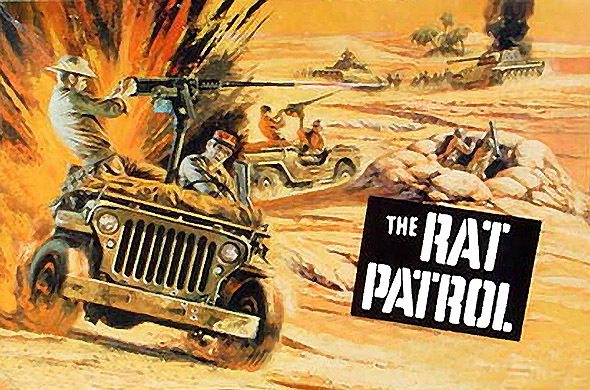 Back in the 1960’s there was this silly TV show called “The Rat Patrol.” The Rat Patrol was built around the idea of two MG armed jeeps manned by Americans plus one British guy who represented the fact that the British were fighting the war in the North African desert way before we showed up with our cool 50 cal armed jeeps. The premise seemed to be based on the British Long Range Commando groups that operated behind German-Italian lines. 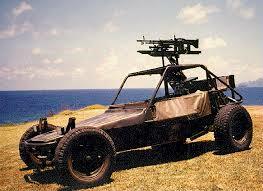 The Rat Patrol was the made for 60’s TV that made it look like we won the war with cool MG jeeps. Yeah, I watched it. I was about 12 and it did have the value of featuring real WW2 equipment from time-to-time. This link will give you a good read on what the Rat Patrol was all about. Seriously though, when I first laid eyes on the little dune buggies my first thought was some kind of upgraded Rat Patrol for the modern era. Turns out I was not far off. My friend had this model kit when we were kids in the sixties. We were just starting to play wargames with miniatures and this boxed set was a bonanza. Not only did you get the jeeps from the popular TV show but you got a couple of German tanks as well. One was a Pz. IV that did see service in North Africa and the other was Pz V (Panther) which did not, but we didn’t care because it was a home run just to have one! The crews of the cool MG jeeps. The Brit is the one on the upper right corner. The guy with the Aussie digger hat is actually the American Sergeant running the show. If memory serves me the American in the lower left corner always wore a Johnnie Reb Civil War cap. Would not be pc today that’s for sure! Below is the first episode on Youtube if you’d like to see what the show was like. Notice the following if you do. The German column in the first scenes is led my US M7 “Priests” self-propelled artillery-a 105mm artillery piece on a Sherman chassis. The next vehicles are US M3 Halftracks modified to look like the German Hanomag 251. Hauptmann Dietrich is leading the column. Although, the Germans always lose and don’t look real bright Dietrich was not the stereo-typical German (Nazi) officer. The war had been over for about 20 years and the West Germans were our allies which probably had something to do with the portrayal of the Germans (not all were Nazis). In some of the later episodes the Germans under Dietrich and the Rat Patrol boys actually join forces against mischievous Arabs that are not that friendly to either side. A little later in the episode when the Rat Patrol returns to base you can see a couple of M-48 Patton tanks driving around. The M-48 was a 1950’s tank. After that scene the camera cuts away to show a parked M-4 Sherman. I guess the first season of the Rat Patrol was filmed in Spain so I suppose that both the M-48s and the Sherman were Spanish (as were the M7s and M3s). Anyway, the show was not meant to be history but all the boys my age watched it and thought it was cool. Today it’s kind of fun to revisit and see some of the old equipment running around in a desert. And apparently, our armed services still have vehicles not dissimilar to the Rat Patrol! I am sorry we do not. I don’t know where the owner of the museum gets his stuff but he seems to have connections. 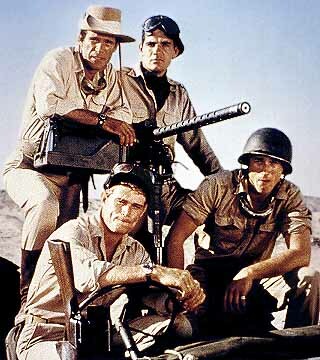 They are group of four Allied commandos set in North Africa during World War II starring Christopher George Justin Tarr Lawrence Casey Gary Raymond & Eric Braeden aired on ABC Network from 1966-68 TV series & became a popular action/adventure military/war melodrama & a true classic TV also in reruns in syndication & on the Youtube Channel & throughout the world. Thanks for stopping by. Yes, I grew up with the Rat Patrol on TV and have looked at it on Youtube. Great nostalgia. In the early 80ies up to 1990ies some time, The Army had those made with BMW engines v-6’s in them, They trained with them in the deserts in the US. They could hold up to four to five personal depending on the configuration. I believe that some units are still using them today. The Army had two drive unit and four wheel drive units, some had front mounted electric, 24 volt wenches on the front some of those wenches could be mounted on the back as well. They also had tow bar hook ups on the front and a hitch on the back. That is very interesting Bert. Thanks for stopping by and sharing it! I’ve always wanted jeep but never bought one. I suppose it all started with the Rat Patrol like you! Thanks for stopping by.